A range of table tennis equipment reviews, information and articles that I have tested and evaluated myself. I'll also post other interesting information related to table tennis. Play technically effectively with the blade of their choice. NOTE: The guide is not a promotional article for Re-Impact, but instead it’s written by a user and for users, to help give users an understanding of the technology, help them select the right model for their style, and teach them how to use the blade most effectively. Today I was absolutely thrilled that Vladimir Samsonov, one of the world's greatest players, has generously accepted my offer of an interview! OOAK forum members get to make up the list of questions, and once compiled they will be passed onto Vladimir. The final interview will be posted in the OOAK forum as well. Players looking for a cheaper substitute for their favourite Butterfly rubber, and in some cases blades as well, is one of the hot topics around the clubs and online communities. As most of you know, about a year ago Butterfly Japan decided to raise their prices worldwide. Now this is not unusual, but the size price hike blew me away! Almost all Japan-made products went up by about huge margins, and some products increase by over 100%! promoting the Butterfly products for many years. Recently many of these have been told that they can no longer be supplied by Butterfly directly, but must now buy from the Butterfly appointed distributor that covers a much larger region. It seems Butterfly is under new managment, who are more profit focussed. Of course this type of thing happens all the time in business, but in this case it seems they are not only letting down loyal players that have supported their products for many years, but also many of their distributors who have spent money and time promoting the Butterfly products for years! So it's not surprising that many players are fed-up with this, and are looking for alternative products. Butterfly is arguable the market leader in equipment, and there is no question that they have a wide range of high quality products used by many players all over the world. However there are many other manufacturers that have a wide range of quality products, and although Butterfly has a few unique and innovative products, the majorty of their equipment has something of similar performance and quality in other brands. OK, what are they? Well this is something that the whole table tennis community can work on together. OOAK forum recently started making a list of the Butterfly rubber equivalents and blade substitutes. Other major forums like Mytt has also many valuable threads discussing Butterfly alternatives, but I think it best to organise this all in one list, so that it can be kept up to date and checked in a central location. It would be great if we as individuals or other forums can support this, and all help add to this list, and as a result, many can benefit and save a lot of money spent on equipment. A lot of equipment does not have an identical product in another brand, but many come very close, and to 95% of players this may well be close enough, in that they either (1) cannot feel the difference, or (2) can easily adjust to the minor differences. If you can help, it easiest to simply respond in the OOAK forum, but you can leave comment here as well, and I can make sure it's added to the list. If you're a Butterfly fan, or you believe the product that you're using has no equivalents and you can affort to keep using it, then go ahead keep using it... I have no problems with this at all, and I understand that changing equipment can be detrimental to people's game. However if you can no longer afford it, or you no longer wish to support the brand, you might just find something on the list that will work just as well, and save you lots of $$$ in the process. This post is not meant to persuade players to stop using Butterfly products, but merely to offer other (usually cheaper) option, which may well be just as suitable for many of us. It's pretty rare these days for me to come across a new piece of equipment that really impresses me, but new Re-impact Tachi blade, did exactly that! Although I had tried a Re-Impact Taipan blade before, it did not really suit my game, so I did not persist with it. However I was intrigued by the huge thread on the OOAK forum about Taichi blade. It was the big difference between forehand and backhand that finally convinced me I had to try it. I chatted to Achim, the owner of Re-Impact in Germany who designs and manufacturers the blade. His knowledge of blades and player's requirments is truly impressive! You can read more about this in the Interview with Achim from Re-Impact. So I finally got the blade, and when I first held one in my hand I took a liking to it straight away. It was very light at only 60g! The handle was nice and thick and soft, as it was also made of balsa wood. The head shape is different from other blades, so you'll probably need to use a new rubber sheet to cover the whole surface (although if you choose the smallest size of the blade you might manage to fit it). 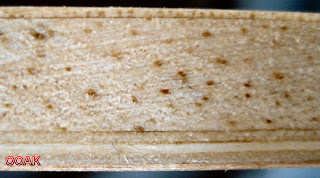 balsa layer on the back gives it quite a unique property. On low impact (such as a passive block against topspin) the speed is really low, gives a lot of 'braking effect' to the ball, allowing you to block short with easy, and with decent spin reversal. However on high impact (such as an aggressive block or counter-hit) it has quite good speed, at least enough to get your opponent on the back-foot. The backhand seems to work best with soft long pimples, and the Tibhar Dtecs is the one recommended as ideal for this blade, but other soft ones should work very well too. The outer ply of the backhand is reasonably hard, which helps spin reversal and makes this blade so effective. The forehand does not really have a balsa feel, and offer decent speed which feels like around OFF- to me, which is pretty much what I'm used to. This is plenty to generate good pace close in, but will need a fast rubber for good high speed away from the table. Since this blade is optimised for close-in play, the speed is good enough for it's purpose. Medium soft and thin sponged Tensors are recommended, but I find that harder sponged Chinese rubbers work very well too. I could probably go on and on about how I love this blade, but since it suits me so well, I'm obviously biassed. I'm certainly not the only that likes the blade though, as you can judge by the huge thread on OOAK but also on the German forums, where the Tachi with Dtecs is a very popular combination. Re-impact do make quite a few other blades as well, but I'm most impressed by their combination blades (blades that have different FH and BH characteristics). They all seem to share the light weight, fairly soft and unique feel and high dwell time. If this is what you like, there may well be a Re-Impact blade that suits you really well. They are not cheap, but considering these are not mass produced but hand made one-by-one by Achim in Germany, the price seems much more reasonable. Anyway prices are always relative... just look at some of the latest Butterfly blades, and these are mass produced! OOAK Table Tennis Shop - facelift and moved! Since I'm no programmer, and all I know about websites is self-taught, I'm pretty happy with the new look and hope others like it too! A large number is custom table tennis bats. If you've got the site bookmarked, please don't forget to update to the new site (although it's re-directed at for now). 1. A weekly Super Special, where they sell an items near or below cost price. These are not clearance items, but usually new or popular items, being sold at a super special price as a bit of a promotion. 2. New Best Price Guaranteed policy, where they match any price of identical products listed in other Australian online stores. Any feedback or recommendation for further imporvements would be very much appreciated! Butterfly Tenergy 05 FX is here - was it worth the wait? The much anticipated Tenergy 05 FX is finally here, and first reports sound very promising. The general perception is that it's a more controlled version of the regular Tenergy 05, and therefore suitable to a wider range of players, particularly lower level player, who struggled to control the Tenergy 05. Basically the Tenergy 05 FX is a Tenergy 05 topsheet with a softer but similar sponge. It retains most of the benefits of the regular 05, but it's more forgiving and easier to play with. I wrote Adham Sharara about my disappointment with the BoD decision to vote down the Swedish proposal. I explained my concern that many of the BoD members may not really understand the impact of the decision, and that they are very likely easily swayed by a few dominant members, who may not necessarily have the interest of our sport at heart. Below is his response. - Most felt that it is better to develop young players without the long pips frictionless rubber. Also based on talking to more than one hundred presidents of national associations, it seems that the frictionless long pips rubber is an issue only in very few countries, it is not as your members think. In fact the problem is in a very small minority. Most associations reported no decrease in participation since the ban. I do always appreciate that Adham takes the time to reply to me, and I commend him for this. Swedish proposal to remove friction limit DEFEATED! Although it's not yet official, the word is out already that the proposal (see last post) was defeated... appearantly the vote was quite overwhelming too... only a few members vote FOR it. The Swedish board member made a good argument, but most of the arguments against were stating that it is not necessary to change the current rule because national association do not need to follow it! I'd personally like to thank those people that have written the BoD member to explain their concerns. I have also written 2 of the members but have been most disappointed that I did not even get a reply! It appears the same thing happened to many others that have written, although I have heard that a few did reply and seemed to by symphathetic towards our concerns. To rescind the ban of pimples without friction by deleting the first sentence of item 1.4.4 of Technical Leaflet T4 shown in bold. The decision to ban the pimples without friction has led to a lot of problems in table tennis without gaining any positive effect. The use of frictionless pimples created a new playing style where defence close to the table was made possible. To ban the frictionless pimples instead of learning how to play against them seems to be the easiest way to meet something new and it definitely stops development. The development of new technique/rubbers/blades from time to time gives life to table tennis and creates interest. - The friction limit is not possible to control in an objective way. Arbitrariness rules. - The ban has caused conflicts between players and between players and officials. - The ban has led to widespread cheating against the new rules. Players bring down friction with different methods and the players who do not, have lost the joy in playing or even stopped entirely to play. - The ban has led to big problems for players, sellers and producers when rubber sheets repeatedly have been banned with very short notice and without explanation. I really think coaching in between games should not be allowed for individual events for Competition and Tournaments. The battle should be between the 2 players, not a player and their coach. I think this is appropropriate even at ITTF events. They have already implimented this for Tennis, so why not for Table Tennis? The coach's role is to coach before the event, and perhaps help prepare the player for the particular match, and analyse the game to give more advice after the match. Coaches should be teaching the player how to analyse the opponent's game during a match, and adapt strategies to counter their strenghts and cover your weakness. This makes the player better, and this can benefit them during a game. I would concede that for team events it may be appropriate, as this is after all a team effort and the caoch could be considered part of the team, but for individual events, there should be no coaching in between games. Some players, especially near the intermediate levels, may not be able to afford a good coach, so should this give him a disadvantage? I don't think so, it should not come into it! "I agree with you, and I even made this proposal already a long time ago, however, there was a very negative reaction from the coaches who felt that they need to be present at the matches and advise their players. I share your opinion, but the tradition in TT is very much engrained and would be difficult to change. I like the tennis system, where the coach is present but does not interfere in the match. On the other hand, like in Basketball, the coach is omni-present. So, it depends on the culture of the sport. In our culture, the coach is an integral part of the match." - For singles we are proposing to reduce from 3 to 2 entries per NOC. - This will allow more NOCs to take part in the singles events at the Olympic Games, which is much desired by all NOCs. So far, since 1988, the average number of NOCs taking part in the table tennis event is around 55. We want to exceed the 60 mark. - The new rule would also allow more NOCs to win medals. The OOAK Table Tennis Forum has been moved and upgraded, and now has a brand new look and a brand new domain! The forum graphics face-lift gives the forum a clear identity of its own as opposed to using a stock theme and increases the usability and legibility of the forum. The forum now has it’s own unique domain of ooakforum.com, instead of running in a subdomain of the ‘One of a Kind Trading’ websites. The new URL highlights that the forum is now independent from other sites. The much shorter URL is much easier to remember and type in, whihc should be handy for those browsing on their phones. Think you're an expert on table tennis? Check out these riddles! OOAK forum is running another little competition, this time about riddles related to table tennis. It's a part of some table tennis bats. Some people will occasionally sniff it. Others would rather throw it out on the water. In some homes, I can run vertically or horizontally. Know what it is? These are some of the tougher ones, although there's a few hints given along the way. There a prize for the person who solves the most riddles, and one for the best riddle. 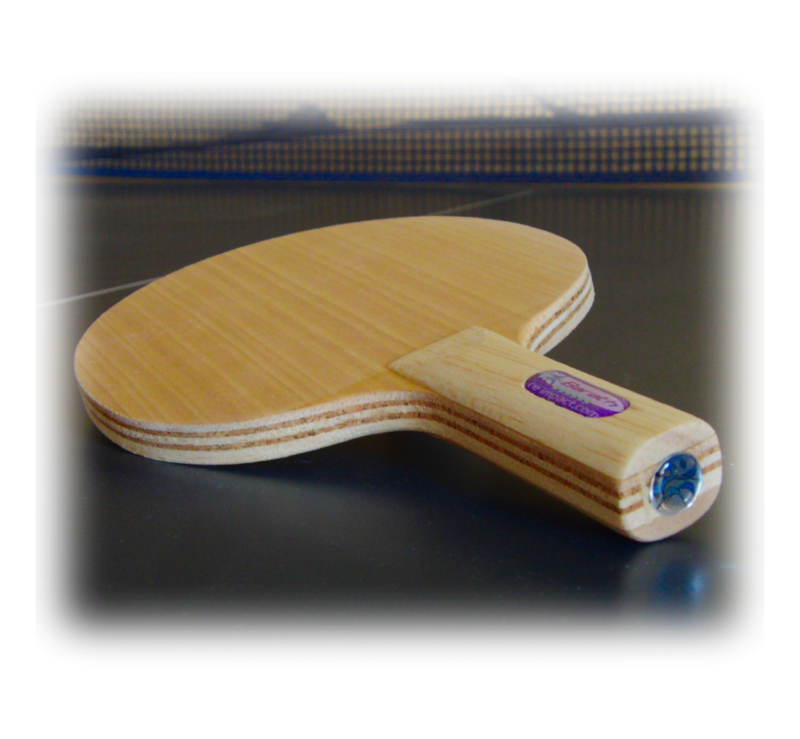 I'm a keen table tennis fan and have been playing competitive and socially for over 25 years... I have access to a lot of equipment, which i like to try and share here on the blog and other table tennis forums. Comments always most welcome!